Though I have no firm idea where I'll be on 2nd June 2012, there is a possibility that it will be in Shepherd's Bush enjoying Bushstock 2012. 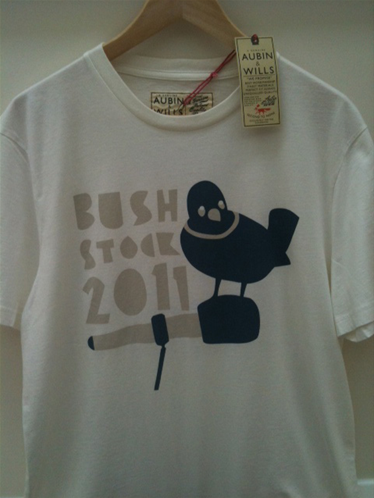 The team at Communion Records announced the date for Bushstock 2012 and Early Bird tickets are already on store. I think I'm right in saying that that will be the weekend of the Queen's 60th Jubilee so there will be an extra bank holiday, so basically, no excuses! Following on from a successful, sunny day this year and with Oxjam Shepherd's Bush Takeover still to happen next month (on Saturday 29th October) it will be interesting to see what is in store for the one day music festival next year. You can reminisce about Bushstock 2011 here. Just as an FYI for anyone who enjoyed Bushstock this year, Communion Records are selling Bushstock 2011 T-shirts half price. I love the design for obvious reasons (it's a bird, innit) and I am so, so tempted by the reduced price, however I already have more clothes than I can take travelling and I don't need to give (nagging) NewMan an excuse to remind me of this. They are very cool T-shirts though so snap one up if you can.